GPS technology provides precise position fixing capability and excellent Dead Reckoning capability, when combined with a stored flight plan. Improvements in the integrity and availability of GPS, and increases in signal strength, are making ground based radio navigation systems redundant. GPS navigation will eventually be accepted as a sole means of enroute navigation � provided the aircraft is fitted with an approved GPS system and the pilot appropriately trained. GNSS is the generic term covering satellite based area navigation systems. The first such � and currently predominant � system is the Global Positioning System [GPS] initially developed by the United States Department of Defense for position fix coordination of the inertial navigation systems [INS] on board military aircraft and cruise missiles. GPS has since become freely available as a valuable supplementary navigation aid to civilian aircraft of all types and all nations � with the compliments of U.S. DoD. The Russians implemented their GLONASS GNSS system some time ago and the European Union is now establishing Galileo, a companion GNSS system to GPS. GPS or the NAVigation Satellite Timing And Ranging [NAVSTAR] system consists of a minimum 24 (typically 32) satellites (of which usually three are operating spares) orbiting Earth at an altitude of 20 000 km with each unit taking about 12 hours to complete one orbit. The NAVSTAR orbits are arranged in six planes with 3 to 4 satellites in each plane. This configuration ensures that a minimum of four satellites would be in view from most locations on Earth at any time. Each NAVSTAR unit is solar powered and equipped with atomic clocks for extremely accurate time measurement. The satellites have an operational life of around 10 years so there is a continuing replacement program, which also allows phased introduction of new technology and expanded facilities. Early launch of replacements often provides more than 24 units in orbit. NAVSTARs continuously transmit information on very low power at two UHF L band frequencies, a coarse acquisition ranging code [the C/A code] on 1575.42 MHz and an encrypted precise positioning service code [the P code] on 1227.6 MHz. The C/A code is freely available to all while the additional P code is only available to authorised users. The C/A code is designed to provide a latitude/longitude position fixing accuracy within 20 metres 95% of the time; but probably better than 20 metre accuracy is achievable most of the time. Similar accuracy is achieved in reporting an aircraft's elevation above a particular reference level. At present it is far more accurate than NDB/ADF or VOR and certainly more accurate than necessary for VFR flight. In aviation a 'sole means' precision IFR navigation system has to meet certain standards with respect to accuracy, integrity, availability and continuity of service. GPS by itself cannot meet those standards, however the ICAO nations are developing a sole means global navigation satellite system based on GPS and Galileo [Galileo is due to be operational in 2008] but augmented with ground and space based correction [or differential] systems, airborne avionics and digital data link communications and control between aircraft and ground stations. GNSS will eventually make obsolete all VORs, NDBs and other ground based systems* and � as manufacturers are developing low cost light aircraft avionics � it now has considerable spin-off benefits to recreational fliers. Manufacture of GPS receivers for all applications is a multi billion dollar industry supplying a wide range from comparatively inexpensive handhelds, such as the Garmin E-Trex, to very expensive panel mounts with integrity monitoring, ground based position correction capability, colour moving map position displays, and an airspace and airfield database. In essence the aviation GPS receivers use the information contained in the C/A code, emanating from each satellite in view, to measure the time lapse of a received radio signal, calculate the distance to each satellite's position and then establish the receiver's three dimensional position by trilateration � a form of triangulation � of the distances from a minimum of three satellites. The distance calculation is derived from the time taken for a satellite radio signal to reach the receiver. As electromagnetic waves, in space, propagate at a speed close to 300 000 km/sec the time taken for the signal to reach the surface from a satellite overhead is 20 000 / 300 000 seconds � about 0.067 seconds. It is also evident that if a position accuracy of, say, one metre is desired then the clock in the GPS receiver must be able to measure transmission times in nanoseconds [billionths of one second]. Aircraft positions are calculated by the receiver in terms of latitude, longitude and elevation. The receiver chips contain mathematical models of the Earth, the most accurate, and commonly used for aviation purposes, is the World Geodesic System 1984 [WGS84] which is the datum for VNCs, VTCs, aerodrome reference points, VOR sites. Handheld receivers may contain a user's database to store a number (maybe 250 or 500) of user defined waypoints (name, latitude and longitude) and maybe 20 flight plan routes each typically allowing a maximum of 30 waypoints. Aviation handhelds will also provide a recognised standard aviation navigation database (compiled by commercial organisations such as Jeppesen, PocketFMS, etc), containing location/elevation co-ordinates and other information for all aerodromes plus VORs, NDBs and intersections shown on Enroute Charts plus controlled and special use airspace . Those location references may also be used as waypoints when defining routes. The receivers provide quite sophisticated "moving map" monochromatic or colour LCD graphics which display the aircraft's position and the relative position of all the waypoints and aviation related detail within a user defined range. The diagram or map can be configured to remove unnecessary items from the display and thus present a less cluttered image. Altitude is calculated as the height above the WGS84 ellipsoid, which differs from the geoid. 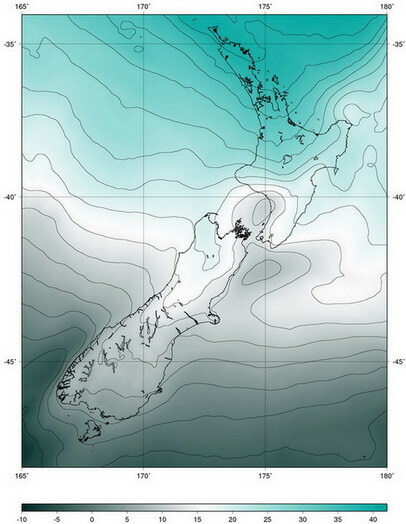 In new Zealand the geoid-ellipsoid separation varies between zero and 40 metres. Newer GPS receivers include tables (based on latitude/longitude grids of varying block sizes) of the geoid-ellipsoid separation values which allow the altitude above the geoid to be displayed, if that option has been selected. 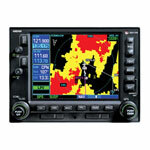 Aviation GPS receivers offer a variety of screen displays with content user configurable and varying between models. The most useful displays for navigation purposes are two; a moving map screen and an alphanumeric navigation page that includes a CDI. Some handhelds also provide a very basic ground map which is usually just a monochromatic grey scale representation of a few significant line features (highways, railroads, coastlines) on which the aviation related detail is overlaid. This is generally sufficient for VFR non-primary navigation use but there are some expensive units on the market which provide a topographic, colour moving map display. Some of these are not current VNCs or VTCs and such map displays may have some detail deficiencies, but many manufacturers provide an upgrade service to maintain current VNCs and airspace databases. The basic moving map, which is the preferred navigation mode, is usually configured to show an aeroplane image at the lower centre of the screen representing the aircraft's position in relation to the flight planned track between current waypoints, airfields and controlled airspace etc. The display can be configured as 'north up' or 'track up'; most people seem to prefer the latter. The track made good will also be displayed together with bearing and distance to the next waypoint. The display can normally be zoomed in or out and thus represent an area ranging from a few square miles to thousands of square miles. The prime GPS use is in enroute navigation, monitoring flight progress against the established flight plan and making the heading corrections necessary to maintain the required track. This requires entering the planned route to the GPS database, activating that GPS route on take-off and making the necessary adjustments, as indicated by the GPS, to maintain track. When used in the moving map navigation mode the GPS display exactly complements the enroute navigation techniques expounded in this section of the Training Manual. Once airborne,and the receiver has locked on to the necessary number of satellites, the planned route is pilot activated. The receiver recalculates the aircraft's position at set intervals of one or two seconds, or less, keeps a history log of the track made good and continually recalculates groundspeed and distance off track. The GPS receiver homes to the next waypoint by indicating the bearing. However if you just fly that bearing, without any heading adjustment for the crosswind component, the bearing will keep changing due to the drift and you will eventually arrive at the waypoint but the track followed will be curved and the magnetic heading flown will be consistently changing. Thus to maintain a constant heading, and the direct track, you still have to calculate, and apply, the wind correction angle. The GPS doesn't directly calculate the heading to fly either to regain the planned track or to fly direct to Warraway. However you don't need to estimate the track error from your chart, the GPS shows the track made good as 077�, the track required was 083� thus the track error is 6�. You can then apply the double track error technique to regain and hold the original track. You will know you have regained track when the GPS indicates that the bearing to the waypoint is 083� so you then make the necessary heading adjustment to maintain track. If you continue to adjust your heading so that track made good, not your heading, matches the bearing you will theoretically continue tracking directly to the waypoint. Alternatively if you prefer to fly directly to the waypoint, rather than first regaining the original track, a quick mental calculation of track error/closing angle will provide the WCA to accomplish that. e.g. Track required: 083� Track made good: 077� thus opening angle = 6�. Track required: 083� Bearing to waypoint: 085� thus closing angle = 2� Opening + closing angles = 8� WCA to track direct to the waypoint. In fact that calculation is simplified by using the difference between the track made good and the bearing � i.e. bearing 085� track made good: 077� thus WCA = 8�. 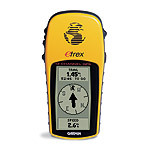 Some handheld aviation GPS receivers provide an E6-B page where, if you enter the heading being flown and the true airspeed, the receiver will estimate the 'winds aloft' from the TMG and groundspeed and then calculate the heading to fly. However due to the limited key board it is not so easy to input data during flight in a light aircraft � impossible if you are wearing gloves � so it is much easier to just use the variant of the track error/closing angle calculation outlined above. Remember that during flight under the Visual Flight Rules you are required to navigate by visual reference to the ground, not the GPS display. That display should only be a fractional portion of your continuing scanning pattern. Most GPS receivers all provide an emergency search key possibly labelled 'GOTO/NRST'. Pressing this key once will bring up a screen displaying the 10 nearest airfields extracted from the database together with the distance and bearing to each. Highlighting one of these airfields and then pressing the 'GOTO/NRST' key again will bring up the alphanumeric navigation screen to 'go to' that airfield. However, and this is a big however, the GPS indicates the direct route to the selected airfield not the safe route. The GPS does not take into account the type of terrain or the height of terrain � the GPS indicated route might be over 'tiger country' or straight through a mountain. The 'GO TO' function is for emergency use, you must not use it as a substitute for proper route planning. Interference. The GPS signal is very weak, and actually quite easily corrupted by interference. Ensure that the mounting/placement of the GPS unit, and associated cables, within the cockpit can cause no interference with the magnetic compass; and other equipment within the cockpit (including cell phones) can't interfere with the GPS receiver. Integrity. Approved panel mounted GPS receivers have an inbuilt integrity monitoring and warning system called RAIM � Receiver Autonomous Integrity Monitoring. Handhelds only have the ability to inform the user when navigation has ceased entirely, they don't warn when a significant degradation in accuracy is occurring. Satellite signal quality- The SQ number is an indication of signal to noise ratio for each satellite in view; 0�1 is useless, 2�3 is undesirable and 7�9 is good. The SQ may be indicated as an un-numbered bar chart but the scale usually reflects the 0�9 range. Horizontal dilution of precision [HDOP]. Some handhelds may show the HDOP value reflecting the relative geometric positioning of the satellites in view. Low HDOP [ less than 02] is best, high HDOP [greater than 06] is not so good for accuracy. Ease of use. The keypads of aviation handhelds are not designed for entering data whilst flying a light aircraft, thus it is very difficult to change route details, for instance, whilst airborne. Some GPS receivers now on the market, purporting to be aviation receivers, seem to have been designed for the much larger road vehicle market. Improper use of the 'go to' function. There is always the temptation to use the 'go to' function as a replacement for proper flight planning.